With many kids going back to school (mine included) I thought I would share with you how I organize our arts, crafts, and school supplies. We don’t have a lot of storage space in our home. It isn’t terrible, but definitely not as much as I would like. I have a 5 and a 2 year old and we do a lot of arts and crafts in our house. My 5 year old is pretty responsible, but my 2 year old has to be supervised with things like crayons, glue, scissors, etc. I can’t have these items too easily accessible to her. Since there are so many different types of art supplies and most of them are pretty small, I was able to use a hanging shoe organizer for almost all of our arts and crafts supplies. I purposely bought a clear one so I could see what we have and what we are running low on. This made it really easy when going school shopping for my son this year. We were able to shop our closet for about 75% of what he needed. As a side note – now is the time to stock up on school supplies. You won’t find better deals. Even before my son started school, I would shop for art supplies for the kids around this time every year. I try to purchase enough to get us through a whole year. Also, I am a bit of an office/school supply hoarder myself and now is the perfect time to stock up! My kids do a lot of coloring with crayons. These all get dumped in a small rubbermaid bin. This is much easier for my 2 year old than trying to navigate the cardboard boxes they come in. Underneath that you will see a bin containing coloring books, stickers, and a few miscellaneous supplies. About every month or so, I go through the crayon bin and pull out the really broken ones. I save them to make our own crayons. I don’t have quite enough to make more yet, but I found this really great star mold at the Dollar Tree that I am excited to try! Won’t those make fun crayons? The bin with the crayons as well as our coloring paper, coloring books, learning worksheets, etc. all get stored in a higher shelf in my son’s closet. My kids do have to ask to work on art projects, but for now this works well for as. As they get older (and my daughter stops drawing on the walls), I will make the art supplies more accessible for them. The magazine folders below hold construction paper and drawing paper in one and preschool workbooks in the other. You can see I hang our large paper from a child’s pants hanger from one of the shelves. I also purchased a roll of craft paper from the hardware store. I can pull off large pieces and the whole roll was only a couple of dollars. Lastly, I have my own office supply cabinet. I have a plastic crate in there that stores extra notebooks, folders, paper, , binder dividers, sheet protectors, etc. These are mostly for my use, but if my kids need something I have it readily available for them. 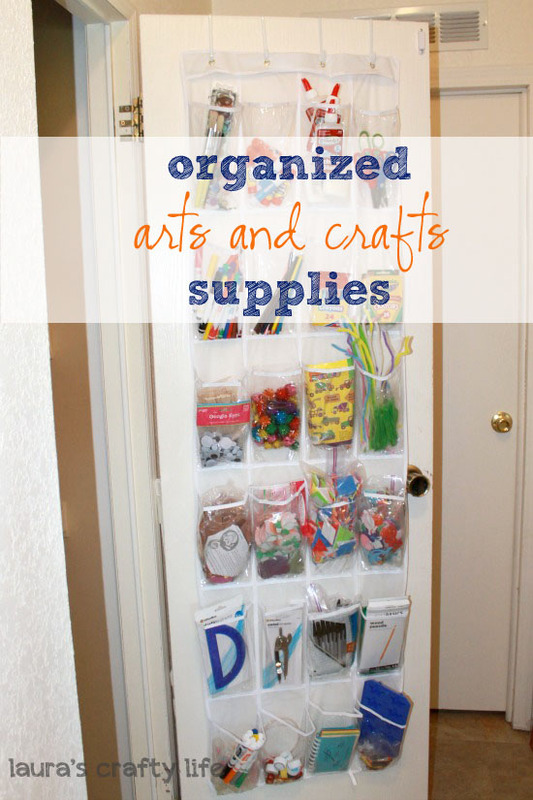 I hope this has given you some ideas as to how to organize all those glue sticks and markers and gets your kids off on the right foot for school! How do you store your art supplies for your kids? Oh My! Great organization! I hope you will link up tomorrow to The CSI Project starting tomorrow. The challenge is Back to School Projects. You just might win. Each week is a new challenge with 3 tutorials, giveaway and a fun guest judge. I’m such an organizational nut I could just stare at all this for hours! Thanks for linking up @ Sugar Bee Crafts. Great organization ideas! Thanks so much for coming out the party at Clean and Scentsible. I’ll be featuring this tomorrow. Enjoy the rest of your weekend! These are all really great tips. I love the over the door storage pockets. Great idea! I need a door – whoever thought I’d be short on doors??! I gave my entry/craft closet up to make my master bath a full bathroom, so I guess it was a good exchange, but you just reminded me how much I miss my closet! :-) That being said, I really, really like – and may be able to put to use – the idea of hanging large paper pads! Wha-laa! That is an awesome idea; thanks for sharing. BTW – I’m a happy new follower of yours. Yeah!!! Great ideas Laura! Arts and crafts can be a messy ordeal and finding places to store all your supplies can be a nightmare. Good to see you’re going to be recycling your old broken crayons to make new ones. Very environmentally friendly! Waste not, want not! Thank you! It is nice to have them easily accessible (but not too easy, I do have a four year old!). We do a lot of spontaneous crafting, which is really fun!